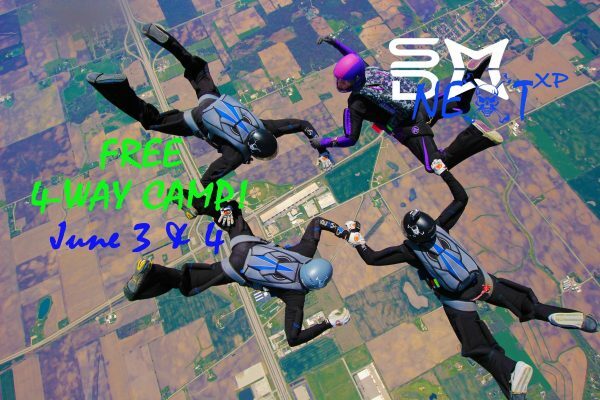 2 Time National Champion 4-Way Team SDMW NEXT XP is hosting a FREE 4-way camp at Skydive Midwest. The team will provide 4-way coaching to ALL skill levels. New jumpers with 50+ jumps will be partnered with similar skill levels and members of NEXT to learn 4-way basics. More experienced fliers will be paired together to perform more advanced and challenging 4-way formations. Existing Intermediate and Advanced teams will be offered ground coaching and video debriefs at no charge! There is truly something for every level of belly-flier at this camp!